While many traditional industry players are looking at BDA and cognitive systems to drive operational efficiencies that will help them reduce their overall cost structure and provide quick ROI, the more progressive companies are starting to utilize these solutions to aggressively enter adjacent industries and market segments. These digital “disruptors” are finding ways to leverage the 3rd Platform technologies – mobile, cloud, analytics and social – as a platform to quickly develop and deploy cognitive systems and BDA solutions that are dramatically changing the way traditional businesses models function. How can organization successfully deploy BDA and cognitive systems which can actually bring benefits to top and bottom line? What are the opportunities that cognitive systems and BDA present? What use/business cases are driving the market today? And which will drive the market in the future? What are the technological and organizational challenges companies will face? What are the solutions vendors provide the technologies and skilled resources to address the major challenges? Which vendors, enterprises and governments are leading the way and what are they doing to drive this success? What steps your organization should take to embark on this journey. This conference will separate the hype from reality; particularly in the area of Cognitive / AI. Discover the next-gen technologies that are already here today, and how they are providing the catalyst for organizations to leap frog ahead of the competition. Technology investment cannot be blind - understanding and extracting the business value is essential for this journey. Join us at the event to understand and visualize the concept of the digital twin - how it applies to all industry verticals, and how underlying new technologies such as Analytics, APIs, Big Data, Cognitive/AI and IoT converge as the nucleus of an organization becoming fully digitally aware. 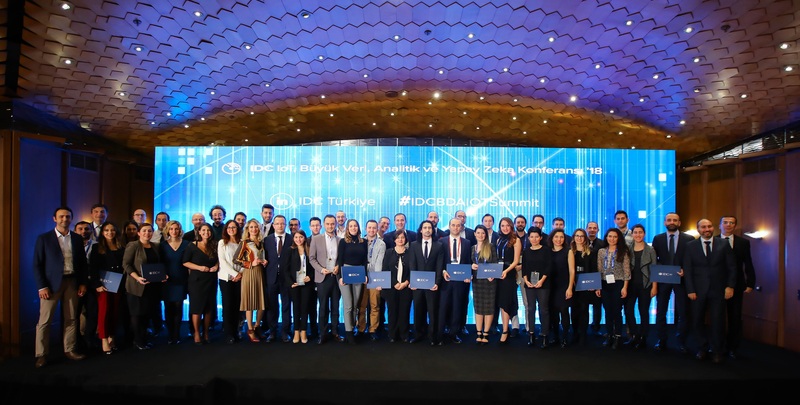 IDC Türkiye’s Big Data and IoT conference will provide insight into the latest trends, and technologies, and provide guidance to business and technology executives on which key factors to consider in their strategic planning when allocating resources for IoT & Big Data initiatives and business plans. 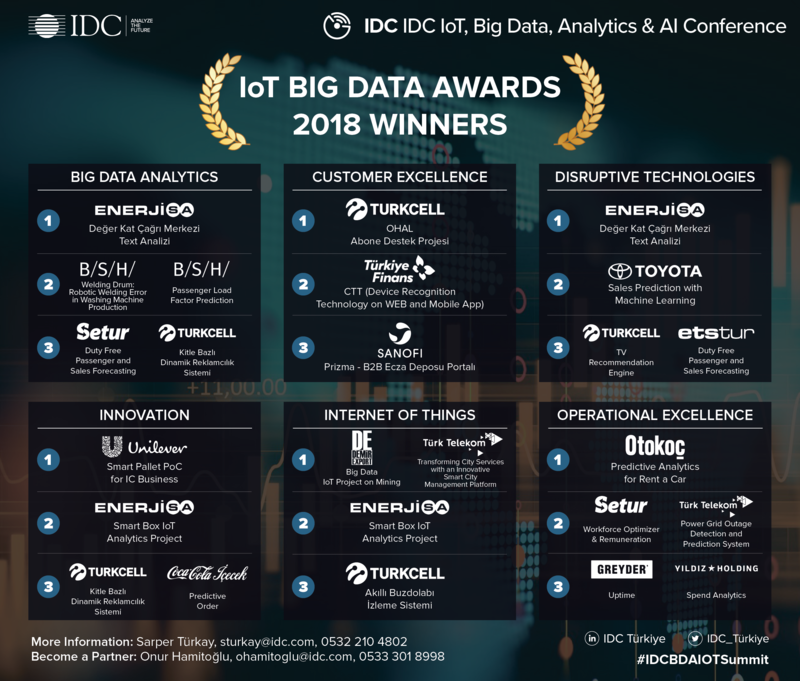 IDC IoT, Big Data ve Analitik Ödülleri Kazananları Belli Oldu! 2018 Yılının En İyi Projelerini seçen Jüri Üyelerimize teşekkür ederiz. Smartvist:	Mekan güvenliği ve konforuna yönelik geliştirdiğimiz ürünler, kapınıza veya pencerinize yaklaşan şahısların ses ve görüntülerini kaydetmekte, yüzleri tanıyabilmekte, sizi mobilden arayarak anında bilgilendirmekte, uzaktan kapı içi sesli alarmı çalıştırmanızı veya isterseniz sesli ve görüntülü iletişim kurmanızı sağlayarak proaktif ve etkin bir güvenlik çözümü sunmaktadır. HUBBOX:	Projemiz endüstriyel amaçlı kendi tasarımımız olan IoT cihazımız ve yazılımımız ile (Endüstri 4.0’ a geçiş sistemi) kolay, hızlı ve uzmanlık gerektirmeden makinelere ve istenilen noktalara hızlı, kolay, güvenli olarak ve çok fazla teknik bilgi gerektirmeden erişim sağlamayı amaçlıyor. Reminis App:	Etkinliklerde çekilen fotoğraflarınıza eşsiz yüz tanıma teknolojisi ile anında ulaşmanızı sağlayan platformdur. Connect-ION:	Kullanım asistanı, geri görüş kamerası olmayan araçlara geri görüş özelliği kazandıracak, üzerindeki sensörlerle sürüş güvenlik ve konforunu artıracak, kolayca monte edilerek kablosuz olarak akıllı telefon ile yönetilebilecek akıllı plakalık projesidir. Inspiring & Educating Data Scientists & Supporting Women In This Field. Software AG is a global, independent software company with a focus on innovation for the digital age. Creators of the world’s first Digital Business Platform, we deliver measurable customer value beyond all expectations. Our mission is to help accelerate and simplify our customer’s digital transformation journey by connecting the world’s applications, data and devices without compromising existing investments. Software AG technologies work seamlessly with the industry’s best solution providers. We specialize in creating best-in-class software that enables our customers to unleash their vision in a smarter, connected world. By integrating dynamic apps, data-rich IoT, predictive analytics, and cloud, on-premises and hybrid deployment options, we’ve built the optimal foundation for building a digital business. To ensure success, we deliver proactive and agile customer support designed to help customers maintain global, 24/7 operations throughout their digital transformation journeys. Software AG has worked on a significant number of digital transformation projects with prestigious Fortune 1000 companies, including: ING, FEDEX, Fujitsu, Deutsche Lufthansa, Mapfre, Infineon, Chevron, Neogrid, Petrochina, Swisscom and many more. Industry analyst firms consistently rank Software AG as a leader across 14 technology categories fueled by our core product families, including Adabas & Natural, Alfabet, Apama, ARIS, Terracotta and webMethods. With our ‘independent’ software philosophy, our customers have the freedom to partner with any industry-leading IT provider to create their own digital ecosystem that integrates seamlessly with their current infrastructure. Established for more than 45 years, Software AG’s 4,500 employees are the doers and visionaries who work tirelessly to bring transformational thinking to our customers through innovation and by adding a human touch to technology that changes the world. IT Network Magazine has been offering professional promotional services in news, buying and selling subjects for developing the institutional cooperation in the information technology up to the world standards. With its 16,000 copies of circulation IT Network is sent out decision-maker top officials, IT and purchasing managers operating notably in the IT, public, finance, health, education and food sectors. All kinds of companies ant experts related to the IT technology are the main recipients of IT Network Magazine. Managers announce their fields of activity, product and services, their positions in the sector, their market shares and innovations through IT Network Magazine which leads the way for the companies who are looking for IT solutions and want to purchase goods and services. Magg4 Dergi, hem magg4.com üzerinden erişebileceğiniz; yazılı, görsel ve video kayıtlarını içeren, dinamik, genç bir dijital platform hem de sanatsal ve estetik kaygının ön planda olduğu, Türkiye’nin en seçkin kurum, kuruluş ve isimlerine iletilmek üzere hazırlanan baskılı ve süreli bir yayındır. 4. Endüstri Devrimi’ni yalnızca sanayi ve üretim bandındaki bir gelişim olarak değil, bütüncül bir paradigma değişimi olarak ele alan Magg4; küresel ekonomiyi ve gündelik yaşantımızı yeniden dizayn eden bu yapıyı; iş dünyasından akademiye, sanattan tıpa, kamudan sosyolojiye kadar uzanan geniş bir perspektif ile değerlendirir. Magg4, ülkemizde gerçekleştirilen çalışmaları mercek altına alarak bir araya getirmeyi ve birlikte değer üretebilmeyi amaçlayan bir "4. Endüstri Devrimi Dergisi"dir. To access this content, please enter the password you have received from IDC. If you do not have a password, please contact Banu Sogut via email, at bsogut@idc.com. * The list is in surname alphabetical order.